The scientists weren't lying. Earth is really dying. What can be done? Together, we can stop the sun. 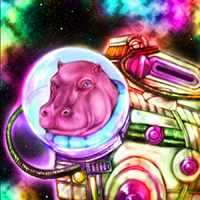 Space Hippo, you're the only one. Hilarious and epic science fiction experienced through live animation and silly voices, with an original score by Elliott Loran. Now with even more puppets! This company has been around for a few years and if you’re familiar with their work, they bring life to shadow puppets by manipulating cut-outs onto a screen. There’s normally a ludicrous plot that acts as the basis to comedy. bolstered by the sinister voice and evil laughs. Fun as always and well worth a watch!